Outstanding on- and off-road performance at a value price. The versatile Wild Trail All Terrain combines rugged durability, superior all-season traction and refined road manners to deliver all-surface performance you can count on. 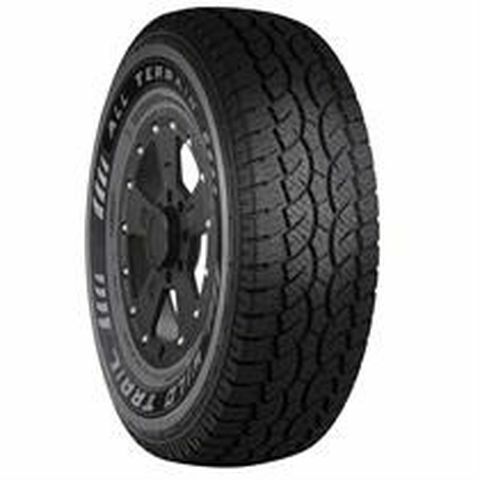 LT265/75R-16 N/A 3,417 lbs 80 psi 15/32nds 8" 11" N/A 32"
Purchase includes the Sigma Wild Trail All Terrain tire only. The wheel rim shown in the picture is not included. Picture provided is a stock picture from the manufacturer and may or may not reflect the actual product being ordered. All Sigma Wild Trail All Terrain tires are continuously developing with manufactured improvements. With that said, Simple Tire and the manufacturers have the right to change these tire specifications at any time without notice or obligation. Please Note: Specifications of the Sigma Wild Trail All Terrain tires shown above are listed to be as accurate as possible based on the information provided to us by Sigma tires. I am very pleased with the tire. For a 10 ply tire the ride comfort surpassed my expectations. The tire performs excellent with a heavy load on the trailer (no sway). They give you a positive feel for the road under all conditions. They wear like iron and still hold the road well. I will recommend them to my friends and definitely purchase them in the future. I almost forgot the great price. they have a tread pattern similar to the Bf Goodrich a/t for less than half of the cost. GREAT TIRE !